This wholesome recipe is is filled with nutrients as well as with a spicy flavor. You can use your preferred red meat mince for preparing this recipe. 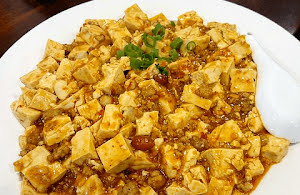 Although there are dozens of variations of Mapo tofu, we'll try to keep things simple. I'm' a big fan of Sichuan cuisine and this is one of the popular recipes you can almost always find in a typical Chinese restaurant across the globe. This flavorful recipe tastes best with both fried rice as well as simple boiled rice. As always, feel free to moderate quantity of spices and flavoring ingredients as per your preferences. Leftovers can be included in any stir-fry preparation. So, let's make this spicy and mouth-watering tofu preparation for our family and friends. Do try this scrumptious tofu recipe which is flavored with select spices and flavoring agents and is enriched with bean and red meat giving it a divine taste. Heat sesame oil in a wok on a medium flame. Add minced garlic and ginger stirring gently for about a minute. Add fermented bean paste and ground Sichuan pepper and continue stir frying for half a minute. Add minced beef with five spice powder and stir with a spatula making sure no lumps are formed. Stir fry till the beef is almost cooked. Toss in tofu cubes with chicken broth. Follow it immediately with addition of soy sauce, potato starch, sugar, chili oil and salt. Gently stir and cook everything until the broth thickens and you get the right consistency. Garnish with chopped spring onion leaves and serve immediately.